February 28, 2008 (Bangkok Post) – Thailand is developing a master plan to build the country into the world’s second largest green energy producer after Brazil. Energy Minister Poonpirom Liptapanlop said she wanted to see the country become a net exporter of green energy to tap strong global demand. November 13, 2007 (Reuters) – Thai police have put out an all-points bulletin for used cooking oil to fuel its patrol fleet as ballooning oil prices eat away the annual crime-fighting budget. Anyone is welcome to contribute a source for biodiesel, from large food processing plants to roadside fried banana stalls. ‘Thai police in the globalised world must have one hand holding pistols and arresting crooks and the other hand making biodiesel,’ said Lieutenant-Colonel Tepvisit Potigengrit, head of a biofuel project at a Bangkok police station. The campaign began in May at three police stations in Bangkok. By the end of this year, police plan to have 80 of their 1,500 stations nationwide run their pickup trucks on biodiesel. 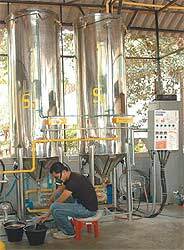 October 8, 2007 (Financial Times Online) – IKF Technologies signed joint venture (JV) agreements with two Thai companies – Kiwin and Kondanna Group (an associate of US-based Kondanna Energy and Petroleum ), reports Business Line.The contract is signed for jatropha plantations, in both Thailand and North East (for bio diesel); and also for supply of fly ash from India. IKF created jatropha plantations in 30,000 acres in Jaintia Hills area of Meghalaya, along with inter-cropping in an additional area of 1,000 acres. IKF also has a presence in the Giridih area of Jharkhand. The company is looking at investment proposals in areas like jatropha plantation, jatropha-based bio diesel, tropical sugarbeet-based ethanol and hydel projects. August 21, 2007 (Point Carbon) – Trading Emissions plc, a London-listed carbon aggregator, has taken a substantial controlling stake in one of the world’s biggest biogas plants and one of the first projects to be eligible for carbon credits in Thailand, the company said today. Through its subsidiary Trading Emissions Asia, the company now owns 81 per cent of Korat Waste to Energy Company (KWTE), which produces electricity from organic material in wastewater. The project is expected to yield over 300,000 carbon credits per year by displacing almost 10 million litres of fuel oil per year.